It is a metabolic disorder characterized by hyperglycemia, glycosuria, hyperlipidemia, negative nitrogen balance and sometimes ketonemia. A widespread pathological change is thickening of capillary basement membrane, increase in vessel wall matrix and cellular proliferation resulting in vascular complications like lumen narrowing, early atherosclerosis, sclerosis of glomerular capillaries, retinopathy, neuropathy, and peripheral vascular insufficiency. There is beta cell destruction in pancreatic islets: the majority of cases are autoimmune (type 1A) antibodies that destroy beta cell are detectable in blood, but some are idiopathic(type 1B)- no beta cell antibody is found. In all type 1 cases circulating insulin levels are low or very low, and patients are more prone to ketosis. This type is less common and has a low degree of genetic disposition. There is no loss or moderate reduction beta cell mass; insulin in circulation is low, normal or even high, no anti-beta cell antibody is demonstrable; has a high degree of a genetic predisposition; generally has a late onset ( past middle age). 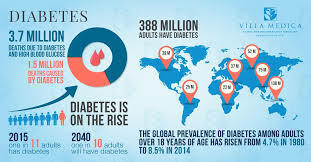 Over 90% of cases of diabetes are type 2 DM. 1. Abnormality in gluco-receptor of beta cells so that they respond at higher glucose concentration or relative beta cell deficiency. In either way, insulin secretion is impaired; may progress to beta cell failure. 2.Reduced sensitivity of peripheral tissues to insulin: reduction in a number of insulin receptors, 'down-regulation' of insulin receptors.